Trevor Ariza dominated in the playoffs despite low-blow karate chop from Mike Dunleavy. Just in time for the start of training camp, here’s a look back at the Wizards run in the playoffs this year. For those with short memories, Washington beat the Bulls in round one, and lost to the Pacers in round two. It was a good couple weeks for a franchise that’s been among the league’s worst the past several years. I’ve finally gotten around to crunching the data to produce the Player Production Average (PPA) numbers. PPA is an overall rating metric I developed that credits players for things they do that help a team win, and debits them for things that don’t. It’s a per-minute stat that’s pace-neutral, accounts for defense, and includes a “degree of difficulty” factor based on the level of competition a player faces while on the floor. In PPA, 100 = average, higher is better, and 45 = replacement level. The numbers reflect Ariza’s tremendous playoffs performance. A 193 in the regular season would be worthy of All-NBA selection in most years. Among playoff performers with at least 100 total minutes, it ranked third overall behind Lebron James (263) and Chris Paul (211). Gortat’s production improved as the playoffs went on. His first round PPA was a shade below average, but his play against Indy in round two pulled his full playoffs rating into the vicinity of his regular season performance. The team’s only other above-average playoffs producer was Beal, who was terrific in round one (152) and solid in round two. A promising post-season debut for a talented kid who will still be among the league’s youngest players when he starts his third season in a few weeks. The post-season wasn’t so kind to Beal’s backcourt partner, John Wall. 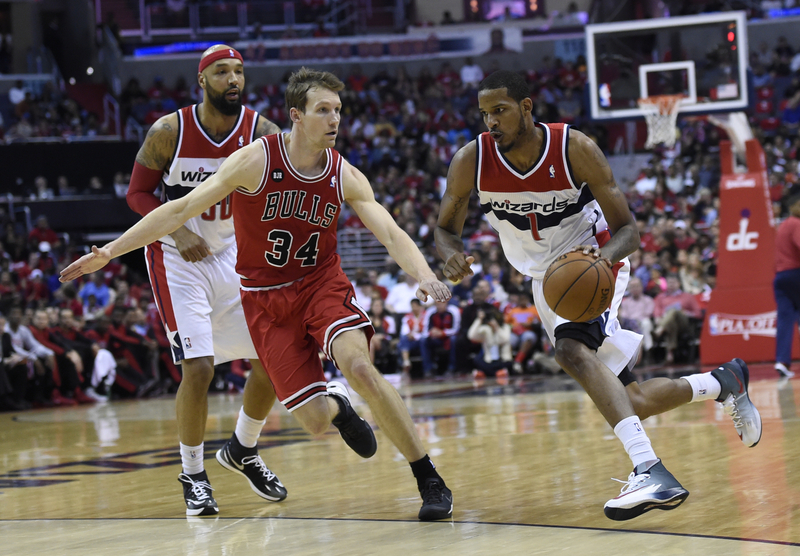 In the first round, Wall’s overall production wasn’t overwhelming, but he thoroughly outplayed Chicago’s guards. Indiana did a better job of forcing him out of comfortable plays, and Wall struggled. Now-departed Trevor Booker was solid in the first round, but played little in the second round. Friend of the blog Ben Becker wondered if Washington might have won against the Pacers if they’d played Booker instead of Gooden and/or Harrington. And, that’s definitely possible. The games were close and hard-fought, and the Wizards got next to nothing from Gooden and less than nothing from Harrington. Booker was fifth on the team in per minute production during the post-season, but 10th in round two minutes. Against the Pacers, the Wizards got good production from Gortat, and little else from the front-court. Using the trio of Nenê, Gooden and Harrington with so little court time for Booker may well have cost Washington a trip to the Eastern Conference Finals.